Soon, September passed by. It was no longer Summer though, situated as we were in the middle of Texas, still the heat would not relent. I was working 10-16 hours a day, six or seven days a week. I spent a lot of my time with Steve. “Any more of what?” I was really confused. We were looking at an abstract design for a computer-centric cards. One of the secret societies was called The Network, so naturally we had a lot of technology touch points in the game as well, and I’d painted it up in shades of green. “Why?” I asked, and when his shoulders tensed, I almost wished I hadn’t. Steve caught me in a strong stare. “Please,” he said. Life went on like that, more or less, for nearly two months, in a blur of dark air-conditioned rooms, take-out meals, and computer-colored artwork reviews with Steve, peppered by the occasional playtest. Pushing a mouse to color artwork for more than 80 hours a week — week after week — will do something to your brain. When the artwork you’re coloring is an extended vision of the power structures of the world and icons of your age and paranoid delusions, it’s possible to create in your mind a perspective that never before existed and may never should have. The eye in the pyramid goes back at least as far as Ancient Egypt. In America, it most famously appears on the back of the U.S. one-dollar bill, though because it’s also been used for hundreds of years by the Freemasons, and it’s commonly believed that many of the Founding Fathers were brother Masons, some see the Great Seal of the United States on the back of the buck as a wink to the conspiracy that was the true force behind the birth of that new democracy. The strength of the symbol is its simplicity. It’s a triangle with a circle in it — that’s all. It makes a perfect seed for paranoia because it takes two of the most simple shapes and produces something that crosses the lowest threshold of what our brains consider to be an actual signal against the noise of randomness around us. It’s a trick, exploiting the limits of our lowest levels of cognition to find a way into our minds. It’s a hack, bringing along whatever you attach to the symbol and giving it a stronger cognitive presence than the payload might have otherwise. Every piece of art in Illuminati: New World Order has an eye in the pyramid in it, somewhere. Sometimes it had been spec’ed for the art, often I had to add it. In reviewing the art, Steve and I sometimes found even better places for them. It was fun. I spent essentially countless hours running a virtual brush along inked lines, watching as the forms abstracted out into their fundamental geometries: adding a subtle eye to a triangle that seemed to be begging for one, or adding acute angles in the shading to create a slanted cone behind a circular form. What little walking around I did outside the office only made it clear to me how far gone I was. The eye in the pyramid was everywhere, when you were looking for it. The only pleasures I allowed myself were music and driving and comic books. The local comic book stores had begun selling collectible card games, given that everyone was buying them, so taking a break to walk around Dragon’s Lair or Austin Books was like walking through a story of economy and commerce that I was at that time myself living. The feedback loop was focusing in some ways, but in other ways not. I stopped showering every day. I shaved rarely. I hadn’t had a haircut in months. I used to let the TV news run in my apartment, all the time, but by that point in the production I had to keep it off or my mind’s noise amplification would create too much signal. I even found myself struggling to avoid reading tabloid headlines at convenience stores. There were secrets in the world, and if someone wasn’t going to tell me what they were, I was going to figure them out myself. I saw conspiracy everywhere, and it wasn’t just me. A lot of us were becoming similarly afflicted, one way or another, which only seemed to make the game deeper. 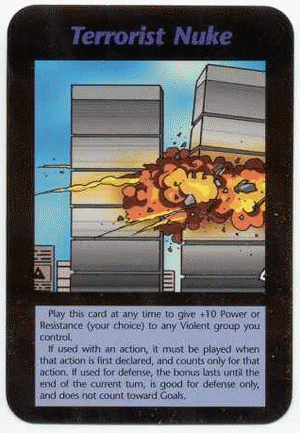 A few of the things that bounced out of our heads in that time strike some people as eerily prescient today, like the card that shows the New York World Trade Center’s twin towers, cropped closely, with one tower exploding from its middle. All I can say is that everything we put in the game seemed very plain to us at the time. I don’t know if that’s a reasonable explanation given that I had become delusionally paranoid. A Street Gang, controlled by the Mafia, attacked the Game Developer. The Local Police, controlled by the Servants of Cthulhu, attacked to destroy a Street Gang, causing it to lose its Safe House. The Archeologists, controlled by the Discordians, took over the Safe House, sharing its protection with the Game Developer. The Mafia attacked the Safe House, but George the Janitor, controlled by the Local Police, blocked the attack. It all made sense, in a fragile sort of way. And while I was dropping card art into the layout, it struck me that the cyberspace I’d long anticipated, that I yearned for, had come true in the form of modern design tools. Those geometric abstractions of pictures and text and boxes that I’d spent days creating and flying over, and which I still struggled to control, described a virtual reality of locations and people and forces which had been designed for the sole purpose of fighting it out with one another. I decided I’d been in cyberspace for years, and never even realized it. All the fears that had welled up in my head for so long were wrung out into that production, and all the pieces that my paranoia put together culminated in an last, fevered round of color correction and art tweaking. The artists themselves, the illustrators, were beginning to feel exhausted, though we were close enough to the end that it didn’t seem to matter. We had what we needed to be successful. It didn’t take the whole two months for Rick to develop into a Photoshop powerhouse, and Jeff was turning in work that I not only didn’t have to touch up, but which I knew was better than the job I’d have done on the same thing. He was more than good enough, by then. He’d developed a genuine skill there, and in the darkness of my office it was impressive. I wasn’t alone in those last weeks. Steve was there with me, and he looked close to as worn out as I felt. We spent an hour or two every day reviewing art, tweaking it there — between getting faster with the tools than I thought possible and lowering my standards slightly, I was often able to get Steve to sign off on a card at first glance by making quick changes right there in front of him. He’d rap on my war-surplus metal desktop that a piece of colored art was now good and we’d move on to the next. One day, I don’t remember why, I stumbled out of my office. It was late, probably close to midnight if not past it — Steve regularly stayed in the office until at least two in the morning — and we were the only two people in the building. “How did it happen?” I asked him. He pushed himself back from his desk, squinted his eyes, and shook his head. “How did what happen?” he asked. I don’t know if what he said was true, but it felt true. The next night, not a week before I’d ship the game to the printer, Steve caught my eye walking past my office. I don’t know why I’d left my door open. “It would have made things easier,” I said. The next morning I showered and shaved and I arrived early, where again Andy was kicking boards in half up in the rotting stable. Wordlessly I joined him, knocking down posts, busting open a knuckle on a too-thick board, working up a sweat. “Good morning,” he said. It was the end of October. I checked my mind. Somehow, it was quiet. It was mostly empty, in order, like it hadn’t been in a very long time. For what it’s worth, Baron Munchausen came to me in much the same way. There was a small revelation—that the only reality of the Munchausen stories is as narrative—and the game arrived like bricks falling from the sky: bang bang bang tetris. The game that appeared in my head and the game that was published are almost identical.